Antarctica: In the Footsteps of the Emperor - BUY THIS DVD! Submerge yourself in the latest Antarctic expedition led by the director of March of the Penguins, Luc Jacquet. Antarctica. is a three-part documentary featuring stunning visuals captured by photographers Laurent Ballest and Vincent Munier as they explore the frozen continent. Traveling aboard a French polar icebreaker in 2016, they documented the marvels of the continent, both on the ice and under it. This series showcases their work and serves as a chronicle of the effect climate change is having on the unique and diverse wildlife in this harsh environment. 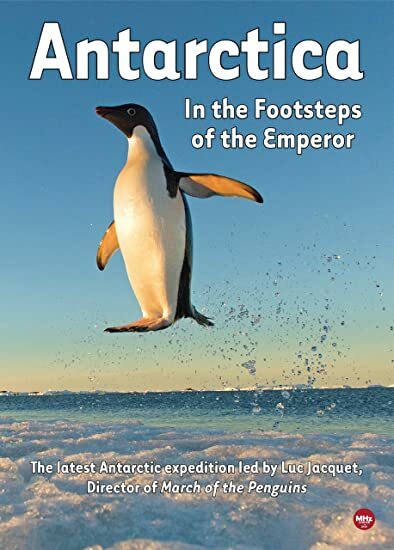 The story is told in three overlapping installments: Antarctica's Secrets and Antarctica: Living on the Edge highlight the flora and fauna of the rapidly changing continent, and the feature-length In the Footsteps of the Emperor focuses on the life cycle of the emperor penguin. The photography is unforgettable particularly the underwater sequences and the penguins are arguably even more compelling than they were in the Oscar-winning documentary March of the Penguins. Get ready for the expedition of a lifetime. THEN SEND IN YOUR NAME, ADDRESS AND 5 COMMENTS TO contests@efilmcritic.com. Put "IS THAT PENGUIN THE THING?" in the subject line and cross your fingers. We will draw names and a winner shall receive a prize package. Only 1 entry per household.